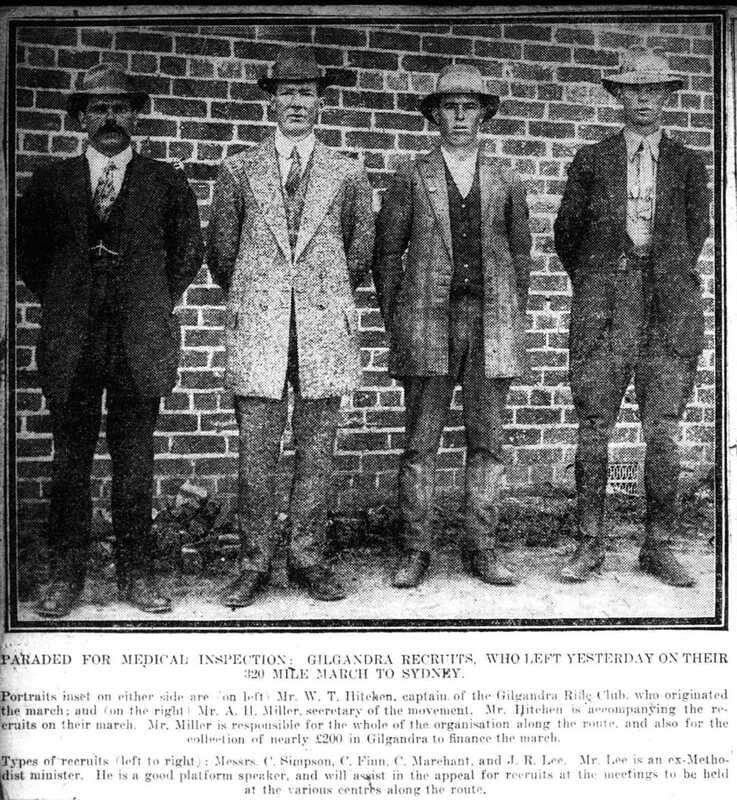 Ernest Simpson was the man standing on the left in this photograph of four of the Gilgandra recruits, that was taken at Gilgandra before the commencement of the Coo-ee March, and published in the Daily Telegraph on 11th October 1915. He was named as “C. Simpson” underneath this photograph, which apparently was a typographical error, (with the initial for his first name having been printed as “C” instead of “E”). The Farmer and Settler, naming him just as ‘Simpson’, published the following report about him on 19th October 1915: ‘In addition to the men sworn in at Gilgandra and at towns en route, the great march column numbers: … Simpson, temporarily unfit, but hoping to pass the doctor in Sydney’. One of the men marching to Sydney has failed to pass the doctor. He waited for three weeks in Gilgandra, paying his own hotel expenses, and then when he stripped for the medical inspection he was “turned down” for hernia. He is physically the strongest man that has offered, and is otherwise “as sound as a bell”. He intends to march to Sydney, undergo an operation upon arrival, and submit himself again. His name was also subsequently recorded as “C. Simpson” in the Gilgandra Weekly. I have wondered what happened to Ernest Simpson after the Coo-ee March, following his being discharged from the A.I.F. at Liverpool Camp as medically unfit due to double inguinal hernia on 29th November 1915 – was he able to undergo an operation for his hernia, and did he re-attempt to go overseas to do his part for the war effort? A few weeks ago I was in contact again with Gary Simpson, who has done some further family history research on his relative Ernest Simpson in the last few years. He had been able to establish that Ernest Simpson had been working as a munitions worker in London from his English marriage certificate, but had not been able to find anything further on when he had gone to London, or when he returned to Australia. With this new information from Gary Simpson, I was able to find the entry for his First World War Australian Munitions Worker record on the National Archives of Australia website, and place an order for it so it could be digitised, which has provided information about what Ernest Simpson did after the Coo-ee March, and the time he spent in England during the First World War. After being discharge medically unfit from the A.I.F. at Liverpool Camp on 29th November 1915, Ernest Simpson stayed for a while at the People’s Palace Hotel in Pitt, Street, Sydney. It is not known if he made enquiries about having an operation to fix his hernia at that time. He then took up employment as a labourer with Lever Bros. at Port Kembla, about May 1916. To fill a skilled labour shortage in England under a joint Australian – British Government Australian Munition Workers scheme, government advertisements appeared in newspapers around Australia from August 1916 calling for skilled workers to volunteer for munitions work in England, with the offer of free passage, special allowances, guaranteed employment, and eventual repatriation to Australia. The scheme was expanded to include navvies and labourers in early 1917 for general labouring work. In July 1917 advertisements were placed in newspapers in which the New South Wales Munitions Committee called for applications from skilled tradesmen, navvies and labourers, to work as munition workers under the scheme, with ‘the need for munitions and aeroplanes to make up the wastage caused by the war calls for as many men as can be obtained to proceed to England to assist in this work’. Ernest Simpson was one of the men who answered this call during July 1917 to do their bit for the war effort in England. On his Commonwealth of Australia Department of Defence Application for Enrolment as Volunteer for Work as Navvy or Labourer in Great Britain form, dated 24th July 1917, he gave his address as Port Kembla, C/o Murrays Boarding House, Port Kembla. His age was recorded as 35 years, his height as 5 feet 9 inches, and his weight as 12 stone 3 pounds. He stated that he had been employed for 14 months by Lever Bros. at Port Kembla. War Worker Simpson was issued War Worker Badge No. 1156, and just over a week after enlisting as a volunteer labourer, embarked from Sydney on H.M.A.T. Medic on 1st August 1917. He arrived in England at Liverpool on 12th October 1917. He began work on 15th October 1917, three days after arriving in England, with Messrs. D. Kerr & Co., Kingston-on-Thames, as a labourer. It is also noted in his file that he had been placed at Messrs. Wills & Sons, Malden at some time, but this period of employment was not dated. However, three months later, his hernia was to make him unable to carry out his duties. Medical reports in his file show that he was admitted to St. Thomas’s Hospital on 25th January 1918, suffering from strangulated hernia, where he received an operation, and was unfit for work until 18th March 1918. A printed Australian War Workers card in his file recorded his private address as 141 Waldegrave Road, Teddington, Middlesex, and his ‘present employer’s name and address as ‘Sopwiths Aviation Coy, Ham, near Kingston Upon Thames’. (The Sopwith Aviation Company designed and manufactured aeroplanes during the First World War – they manufactured Snipe, Dolphin and Salamander fighter planes at their aircraft factory at Ham, near Kingston Upon Thames, Surrey). Five and half months later, he was again having trouble with his hernia. On 2nd September 1918, he presented a medical certificate to the Officer-in-Charge, Australian Munitions Workers, England, that stated he was suffering from hernia and was unable to follow his employment, and reported that he was ‘going to St. Thomas’s Hospital to see if operation was necessary, as has been operated on before’ . Sometime after his arrival in England in October 1917, he met his future wife. His wedding certificate records that Ernest Simpson, Munitions Worker, of 141 Waldegrave Road, Teddington, married Miss Lilian Margaret Lee, of Waldegrave Road, Teddington, on 31st December 1918 at the Register Office in the District of Kingston, in the County of Surrey. A letter to his Officer-in-Charge dated 1st January 1919 stated he was now married and wished to be repatriated to Australia. War Worker Simpson, and his wife and infant child, departed England for return to Australia on the H.M.A.T. Benalla on 2nd April 1919. They disembarked in Australia on 2nd June 1919. He was discharged ‘completion of agreement’ the same day. However, his hernia problems were not yet over. “On my return to Australia by the S.S. “Benalla” on the 31st May, 1919, I was admitted to Hospital suffering from Hernia. That I underwent an operation in England and also since my return to Australia. That I was discharged from hospital on the 9th August last. That the Senior Medical Officer, Military Hospital, Sydney, advised me not to take on any heavy work for a few months”. His Commonwealth of Australia Department of Defence certificate of service finishes with the statement: ‘His record during the period of his agreement was satisfactory, War Worker Simpson, who has received medical attention from this Department, was discharged from hospital in Australia on 9th August 1919’. Note: I would like to acknowledge the research assistance of Gary Simpson in writing this article. THE GREAT RECRUITING MARCH. (1915, October 11). The Daily Telegraph (Sydney, NSW : 1883 – 1930), p. 9. Retrieved June 7, 2018, from http://nla.gov.au/nla.news-article239111014 ; SERVING THE AT FRONT (1915, October 22). NAA: MT1139/1, SIMPSON ERNEST – Munitions Worker Number 1156. NAA: MT1139/1, SIMPSON ERNEST – Munitions Worker Number 1156, p. 11. Marriage Certificate of Ernest Simpson and Lilian Margaret Lee, Kingston, 31 December 1918. General Register Office, London, England. (Details courtesy of Gary Simpson). NAA: MT1139/1, SIMPSON ERNEST – Munitions Worker Number 1156, p. 16. NAA: MT1139/1, SIMPSON ERNEST – Munitions Worker Number 1156, p. 21.